We run a small family-run business whose members have always been committed to farming. Our main crops are cereals, olives and citrus fruits. We started growing citrus fruits twenty years ago. From the very beginning our goal has always been the cultivation of ORGANIC SICILIAN BLOOD ORANGES. 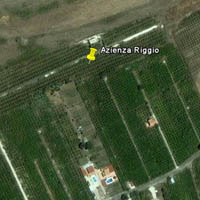 Our farm is in Francofonte (Siracusa) in the contrada Passaneto (see the map). This is near the border of the province of Siracusa with that of Catania. The district of Francofonte (Siracusa) is within the zone that profits from IGP status. The district is renowned by workers in the sector as a zone with a natural propensity for orange production. The oranges from this zone are among the BEST IN THE WORLD. You only have to taste them to see that these oranges are not like the rest and we do not have to worry about the competition. These characteristics are all enhanced by our organic ethos. We only use natural substances and fertilizer when cultivating our oranges and we do not use agrichemicals or anything that is chemically synthesised. If we do have an infestation of harmful insects, we use other insects which naturally combat the invading species. The consumer should be aware that ‘treated’ oranges can absorb traces of harmful chemicals which are used in farming. These oranges also contain wax and paraffin which are normally used to make the peel shiny and give it an artificially (and falsely) pleasing appearance. Moreover, ten years ago, we presented the European Community with a forestation project, which follows CEE 2080/92. This project incorporated the planting of around 25000 trees including corks, eucalyptuses, pines and carobs covering around fifty hectares. Nowadays the plantation is growing and is making its own contribution to the ‘green lung’ made up of all the forests in the area. We are independent and our aim in business is to reduce costs as much as possible so that we can have a competitive quality/ price balance.